RAL-DSDHA2 has a large size toroidal transformer, low noise, high speed SBD rectifier and primary and secondary low noise LDO regulators for each circuit blocks per function unit boards. 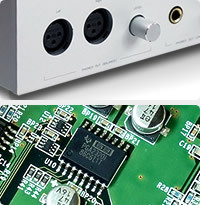 DSD and HD-PCM(24/192k) ready USB DAC with Balanced Headphone amp. Ready for DSD64 and High Density 24bit / 192kHz PCM. Compatible with your favorite Music Player. Don't need to change Music Player. Just Plug & Play with Windows PC and Mac. Excellent Digital circuit design and firmware. High quality and high performance Analog circuit. Powerful Power Circuit supports powerful sound. Ready for DSD64 and High Density 24bit/192kHz PCM. 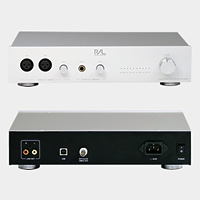 RAL-DSDHA2 receives DoP format compatible DSD digital music stream, passes it to DSD Direct enabled DAC and creates clear and natural sound without any conversion. Compatible with your favorite Music Player. Don't need to change Music Player. RAL-DSDHA2 is fully compatible with DoP(DSD over PCM) Standard 1.1 and works with popular Music Players, such as Audirvana Plus on MacOS X, foobar2000 with foo_asio_dsd, HQPlayer and JPLAY on Windows PC. No 'Harsh Noise' at a gap of music (PCM to DSD, DSD to PCM). It allows DSDF or DSDIFF files can be added to your PCM Playlist and gap-less music. 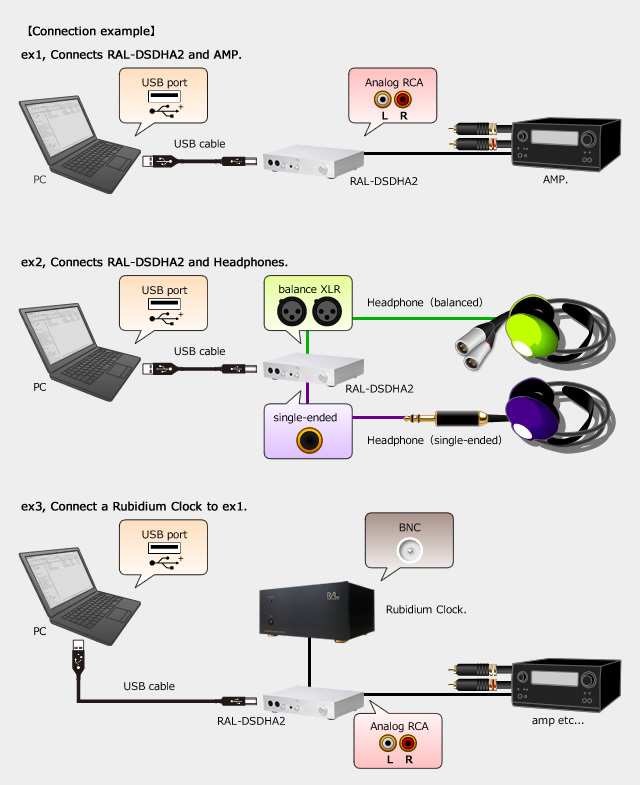 RAL-DSDHA2 is fully compatible with USB 2.0 High Speed specification and USB Audio Class 2 Specification. Don't need to install drivers for Mac OS. Windows XP, Vista, 7 and 8 requires USB Audio Class 2 ASIO compatible driver at the first time, the driver is included in the package and works fine on both 32bit and 64bit Windows. 32bit, parallel processing RISC MPU and multi thread firmware brings noise free fluent music. Two internal Cristal oscillator modules (24.756Mhz, 22.5792MHz) generate precise jitter free Audio Master Clock and execute precise D/A conversion with High Performance DAC. RAL-DSDHA2 has an external Rubidium Oscillator (10MHz) input port and makes precise Audio Master Clock based on Rubidium Clock. High current, High Slew rate and low distortion Headphone amplifier provide enough power (600mW/68Ohm) to High impedance (600 Ohm) headphones. Headphone output level adjustment switch covers from low impedance headphones (32 Ohm) to high impedance headphones(600 Ohm). RAL-DSDHA2 has the Balanced Headphone Output port, it brings clear and good separation sound, also it has a independent powerful single-ended Headphone Output (910mW/68Ohm). Digital Volume control for Headphone and Line Output and enables to provide enough output level directly to power amplifiers.